President Trump has announced plans to recklessly withdraw the U.S. from the Paris climate agreement ... taken aim at the Clean Power Plan, the landmark plan to reduce carbon pollution from power plants ... greenlighted the disastrous Keystone XL pipeline ... rolled back vital clean car standards ... and and is actively weakening the EPA, changes to the EPA decimating the agency's ability to do its job tackling climate change, ensuring clean air and clean drinking water, and enforcing environmental safeguards. Help NRDC fight to protect America’s global leadership on climate change and block these disastrous environmental rollbacks. 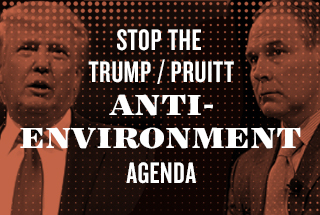 Tell Trump and Pruitt they'll face massive opposition from you and thousands of others if they attempt to put polluters before the American people and dismantle critical safeguards that protect our climate, clean air and water and our health. Tell President Trump and EPA Administrator Scott Pruitt that we'll fight every attempt they make to put polluter profits before the American people! Dear President Trump and Administrator Pruitt, President Trump, you weren't elected to demolish our environmental laws, kill clean air and water protections or jeopardize action against climate change. Administrator Pruitt, as America's new top environmental official, you are responsible for protecting the health and safety of our families and our environment. Please fulfill your mission to protect the American people, not the big polluters. I oppose any efforts by you to: *	Weakening the EPA, cutting staff, and drastically undermining the agency's ability to defend our environment *	Dismantle the Clean Power Plan and other critical measures to save our climate and build a clean energy future * Roll back vital clean car standards that would dramatically reduce carbon pollution from cars and trucks * Allow the skyrocketing use of bee-killing pesticides to drive bee populations to the brink and threaten our health and food supply *	Weaken or eliminate fundamental protections for clean air, clean water and public health I support NRDC in taking strong action -- through the regulatory process and in the courts -- against reversals like these. And I am ready to fight back against any move your agency makes that thwarts progress in combating climate change, the most pressing challenge of our generation.